Please remove the plastic wrap off the batteries at first time use, otherwise can't be recharged success! 3* T6 bulbs, Super brightness and durable. Working Voltage: 3.6~4.2 V ,Light is very evenly spread in a flood pattern, suitable for Fishing. 1. Please remove the plastic wrap off the batteries at first time use,otherwise can't recharge success! 100% new headlamp, using 3 original CREE XML T6 LED bulbs delivering 5000 Lumens beam. Extremely LONG LIFE up to about 10W hours. Durable aviation aluminum alloy crust,abrasion resistance; Lamp and rechargeable battery compartment could waterproof, dustproof and snowproof etc to provide perfect outdoor sports experience. 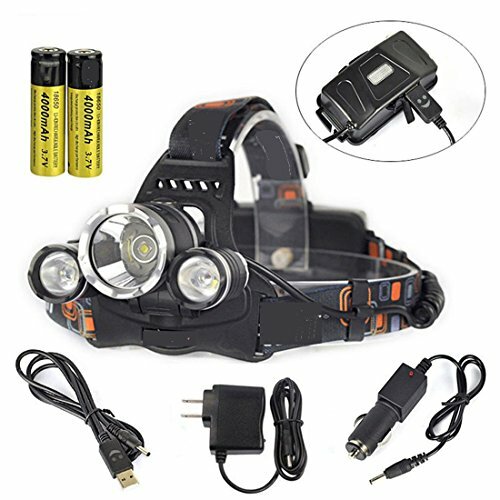 Adjustable 90 degree base is provided for each head lamp, with back and forth inclination, comfortable and no pressure; Hands-free to achieve a real convenient outdoor sport or travel! One button swith support 4 WORKING MODES: Battery Saver(1 LED) / Medium Brightness (2 LED) / Ultra Brightness(3 LED) / Strobe(3 LED). The item also includes TWO pack FREE high quality 3000mAh 18650 batteries, which could be used 3hrs continuously. It can be used as an emergency mobile power when the battery is full. If you have any questions about this product by JoyClan, contact us by completing and submitting the form below. If you are looking for a specif part number, please include it with your message.